What does it mean to be a social business? How does Ecosia neutralize a search's CO2 emissions? How do I get Ecosia to support my project? Like any other search engine, Ecosia earns money from clicks on the advertisements that appear above and beside the search results. The advertisements on Ecosia are clearly labeled as Ads and are text links to websites that pay for each click by users. The ads are delivered to you by our partner Bing, who pays Ecosia a share of the revenue generated via these ads. 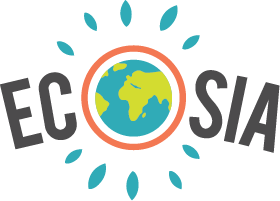 Ecosia earns a few cents for every click on an ad from Bing – or a portion of the purchase price made through an affiliate link. Ecosia then gives the profits from this ad revenue to planting projects. We also make a small income on commission from our online store. All profits we receive go towards our projects – which means we can plant 20 trees every time we sell a t-shirt. How much do you earn per ad click? How much we earn per click on an ad varies depending on the competition on the key word and the value of what is being advertised. Some search terms like "credit", "bank account" or "solar panel" come with more lucrative ads than, for example, "chocolate" or "sticky notes". A click on one of the more lucrative keyword ads may finance multiple trees at a time, others may finance a fraction. Taking into account that not every Ecosia user clicks on an ad every time they search, we earn an average of 0.5 cents (Euro) per search. Does one search finance one new tree? No, it takes approximately 45 searches to finance the planting of one tree. We know that Ecosia earns an average of 0.5 cents (EUR) per search. It costs our tree planting partners about 0.22 EUR to plant a tree. 22 cents divided by 0.5 cents makes about 45 searches until we can plant one new tree. Depending on clicks on ads and how much search ad revenue these generate for Ecosia, it may take fewer searches. Think of it this way: we currently fund the planting of a new tree every second. How much money do you make in a month? This depends on - you probably guessed it - clicks on ads. During the European summer months, our net revenue is often lower because people would rather be outside, whereas in winter our revenue peaks (especially around Christmas). To keep track of our monthly earnings and costs, take a look at our financial reports. How much money goes into tree-planting programs? Whereas our monthly income may vary, one thing is always for sure: we use our profits from search ad revenue for tree planting!